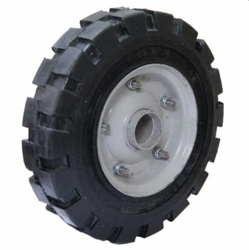 Leading Manufacturer of heavy duty rubber wheel, rubber type car wheel and heavy duty tractor rubber wheel from Ahmedabad. Backed by vast industry exposure, we are engaged in presenting a wide assortment of Heavy Duty Rubber Wheel in the market. These products are highly appreciated for their corrosion resistance, reliable performance and dimensionally accurate. Moreover, these products are used in principally expensive applications such as material moving, trash containers, lumber carts, storage tanks, platform trucks, and many manually pushed applications. 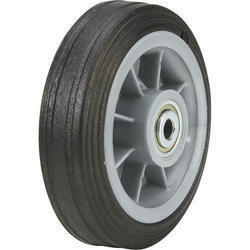 Size of Tyre 12" - 16"
We offer Heavy Duty Tractor Rubber Wheel and Ps heay rim also available.